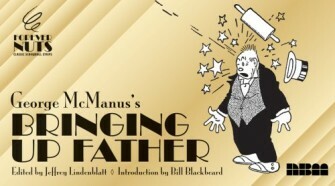 It's difficult to conceive of a piece of modern pop culture functioning the same way as Bringing Up Father in the strips collected in the new "Forever Nuts" imprint offering from NBM. Everything from actions to motivations to backgrounds have been stripped down miles past what you might see on the first season of a long-running television show might. At times it seems as if the entire world in which Maggie and Jiggs would later operate has been boiled clean out from under their feet. Reading the new book is is like watching the first few performances of a stage show that would later move to television and even later move to film; the whole production could fit into a sizable suitcase. Jiggs' fondness for the glories of lower-class living, the ongoing presence of which would later indicate the newly-rich patriarch sympathetically conservative and frequently indulgent personality, is portrayed in these early days more like a Harvey Comics-style, character defining obsession. Jiggs could be "Little Dinty," for as purely as he longs for the experiences and company of days gone by. McManus' clear, thin line only supports the bare-bones feel of the entire enterprise. Thankfully, most of what we see is funny in a way that the world bending to these jokes seems more celebratory than depressing. The characters hit their marks solidly and with meager levels of fuss; that they're all essentially pulling in the same direction adds another layer of amusement. My favorite pages build into an overseas sequence where Jiggs is cut free from the accoutrements of the good old days but still manages to uncover an endless array of portly, disheveled enablers. Jiggs was relentless in those days; later, he mostly endures.